Digital Marketers and PPC People – Meet (Your New Best Friend) Reportly! Reportly is a PPC reporting tool (developed by Sum Digital) that delivers Google AdWords, Facebook Ads, and Bing Ads performance data via daily emails. Unlike most other reporting tools, PPC performance data is delivered in the body of the email. No hyperlinks to click on, no login credentials to worry about. Reportly is optimized for mobile devices and designed to be simple and streamlined. It reports on core performance metrics such as cost, conversions, and cost-per-conversion or cost, revenue and ROAS. Importantly, Reportly highlights trend data, with period-over-period changes reported as absolute and percentage changes. Users can choose one or several look-back periods including yesterday, last 7 days, last 14 days, last 30 days, and full-month trend reports delivered at the end of each month. Frequency of report delivery is set by the user – options include certain days of the week (e.g. every Monday), or every day. Data is presented in an easy-to-digest format at 3 levels – summary data (all 3 ad platforms), ad platform data, and campaign level data. 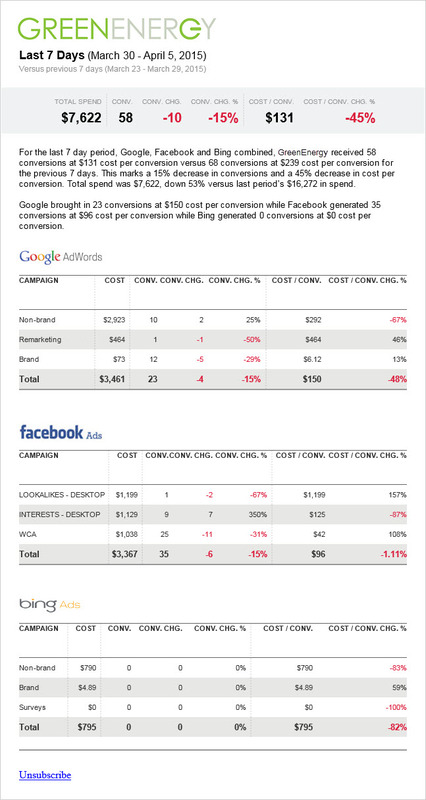 Since the most important PPC ad platform is the one that is spending the most money, platform data is sorted by cost, descending. 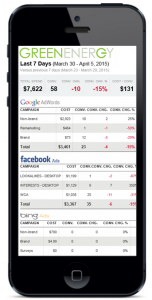 Reportly is great for keeping an eye on your PPC performance. Users have also found it to be useful for understanding conversion / revenue latency; checking the accuracy of human-built reports; and prioritizing the day’s PPC tasks. Reportly is currently a free service, though it likely will cost a small monthly fee in the future. We invite PPC marketers and anyone interested in their online advertising data to use it – sign up for an account today! Terry, you and your team are awesome. Keep up the good work! Congratulations on the launch, Terry. This will help a lot of folks. Pretty cool! Should be helpful for people who have to compile weekly KPIs, too, because then you don’t have to go into the interface, select the exact date range, filter out what you don’t want to see….